On Sunday I got to play! I attended a mixed media workshop given by Stephanie Reisch http://www.lintonandkay.com.au/artists/stephanie-reisch/at Mundarng Art Centre, where Stephanie was holding a successful exhibition ‘ Silent Synchronicity’. Stephanie’s works are abstract but relate to natural forms. She paints with natural pigments and likes to incorporate elements of history – like bones – to capture elements of synchronicity, trace and essence. 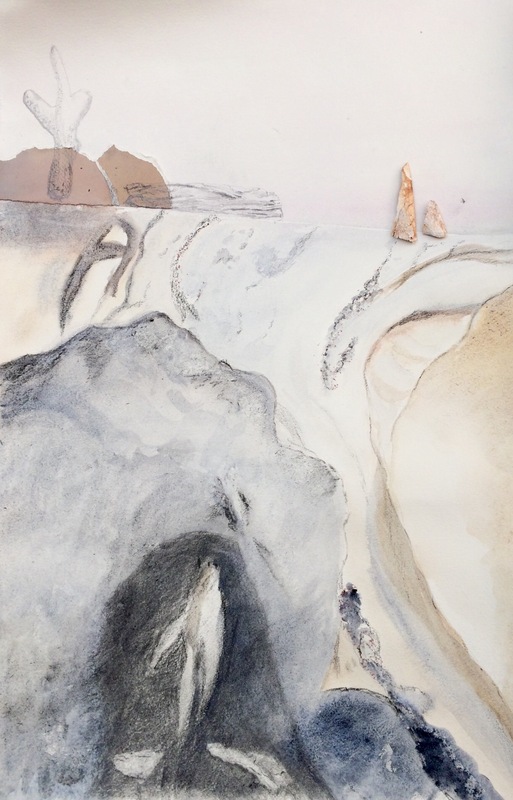 My effort did incorporate Daniel Smith natural pigment watercolour, graphite, charcoal, wax pencil, pieces of bone and drawings of coral and driftwood as Stephanie encouraged, using a reference photo of what appeared to be underground caves and water. However, I wonder what it means to me and curious as to others may see it! This entry was posted in All Posts, Art of a Different Kind? and tagged Mixed Media, Silent Synchronicity, Stephanie Reisch, Workshop on July 12, 2018 by Helen.